Designed for precollege teachers by a collaborative of teachers, educators, and mathematicians, Famous Functions in Number Theory is based on a course offered in the Summer School Teacher Program at the Park City Mathematics Institute. But this book isn't a “course” in the traditional sense. It consists of a carefully sequenced collection of problem sets designed to develop several interconnected mathematical themes, and one of the goals of the problem sets is for readers to uncover these themes for themselves. Famous Functions in Number Theory introduces readers to the use of formal algebra in number theory. Through numerical experiments, participants learn how to use polynomial algebra as a bookkeeping mechanism that allows them to count divisors, build multiplicative functions, and compile multiplicative functions in a certain way that produces new ones. One capstone of the investigations is a beautiful result attributed to Fermat that determines the number of ways a positive integer can be written as a sum of two perfect squares. 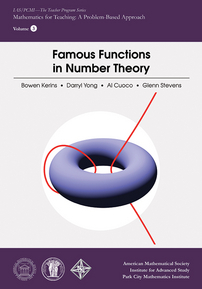 Famous Functions in Number Theory is a volume of the book series “IAS/PCMI—The Teacher Program Series” published by the American Mathematical Society. Each volume in that series covers the content of one Summer School Teacher Program year and is independent of the rest. Titles in this series are co-published with the Institute for Advanced Study/Park City Mathematics Institute. In-service secondary school teachers; students training to become secondary school teachers.